So, of course, she turns to FB – because FB has all the answers, right?!? If you can’t get the tea (the scoop, the info) from your people then where can you get it? Her friends come through and they deliver copious amounts of suggestions and methods for getting the perfect hard boiled egg! But really, we all know the gal in this story is me, y’all. So, I took a couple of the recommended methods and tested them out for y’all! **Thank you, so much, Lindsey, Kristi, Karen, Katie H., Katie F., Meghan O., Kevin, Jennifer, Crystal, Tara, Selena, Jen, Celita, Kylee, Stacy, Lindsey, Julia, Jacque, Sarah, Melissa, Marian, Megan Y., Tana, Lisa, Megan S., Stephanie, Georgia, and Laralee for all the fantastic advice! You guys made this post possible! 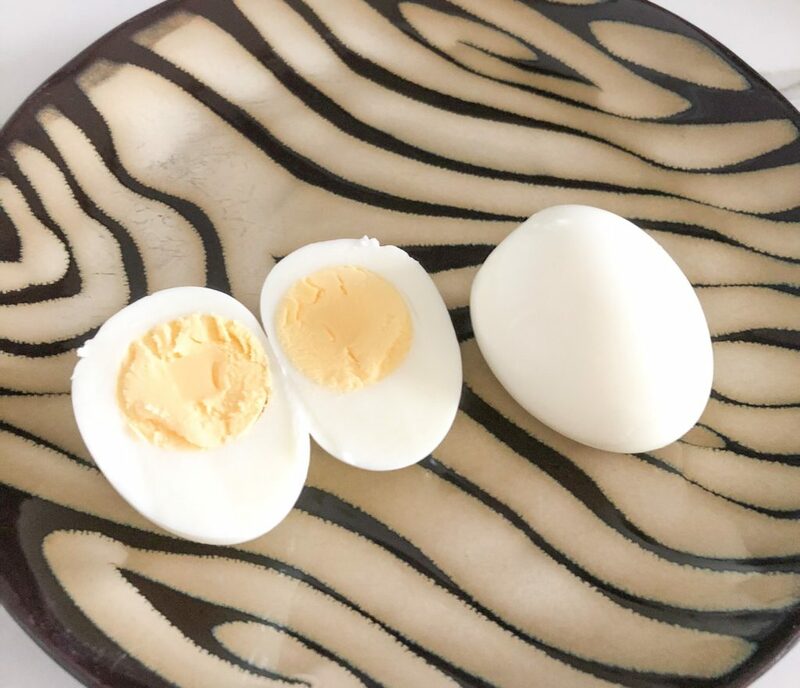 I had a few previously boiled eggs in the fridge that needed to be used and many people recommended peeling the eggs under running water to help lift the shells off the egg. Keep in mind, my previous method of boiling the eggs was as follows: 1.Place eggs in pot 2.Cover with water 3.Put pot on burner (on high) 4. Leave to go grocery shopping and let husband manage the eggs as he sees fit. So, peeling the previously boiled egg under running water definitely helped the shell come off easier. But, the egg still stuck to the shell in many places and I was left with only a portion of the egg white that was eatable. A few days later, I decided to try two different methods. One, the uber famous Insta-Pot and two, the traditional method (with a couple of the recommended hacks). The long and short of it is this. 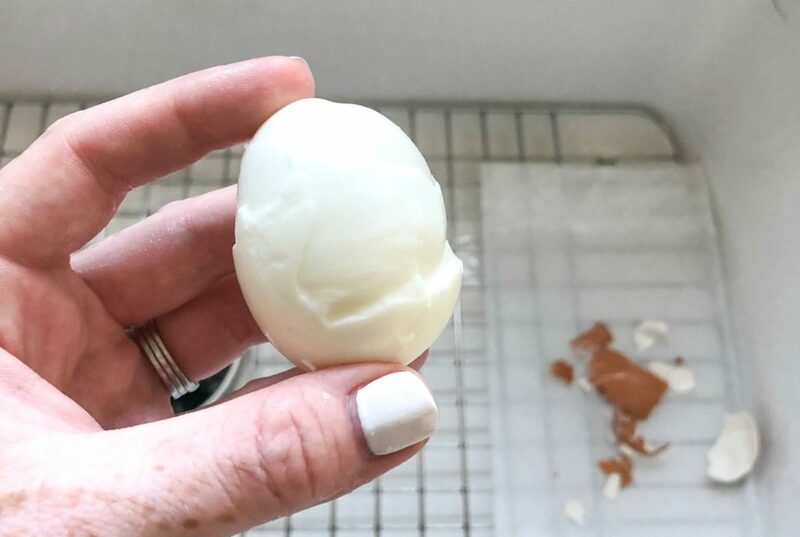 The Insta-Pot method reigns supreme when it comes to making the perfect hard boiled egg! I had two criteria the egg had to meet to be deemed “perfect” by me. 1. Peels flawlessly (both, immediately after cooking and after being refrigerated for several days) and 2. has a pretty yellow yolk, rather than a funky green one! I also wanted to test out a traditional boiling method for anyone who doesn’t have an Insta-Pot. Here are the steps I followed for the traditional method: 0.Use eggs that were purchased 5-7 days beforehand 1. Bring a pot of water (liberally salted) to a full boil 2. Add eggs and boil for 8-10 min 3. Turn off the burner and put eggs into an ice bath for 5 min 4. Peel under running water. Guys, this method makes me feel like the lady who can burn water. I just can’t seem to get it right. The yolks were still a nice yellow color but the eggs stuck to the shell more often than I would have liked. So, bring on the Insta-Pot! I’m not well versed in Insta-Pot usage so I turned to Pinterest and found a quick and easy recipe from My Wife Can Cook. 0. Again, I used eggs that I’d bought several days beforehand. 1. 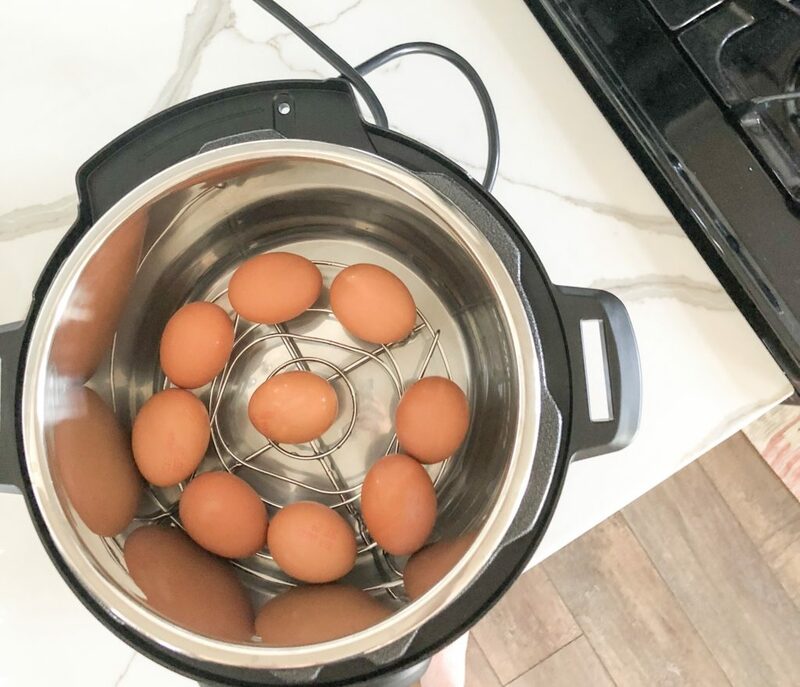 Place the eggs in a single layer on the rack that comes with your Insta-Pot 2. Add 1 cup of water to bottom of pot 3. Put on lid and ensure the vent is closed 4. Press “pressure cook” or manual and set time for 7 minutes 5. Once the 7 minute cycle has ended carefully release the pressure valve 6. 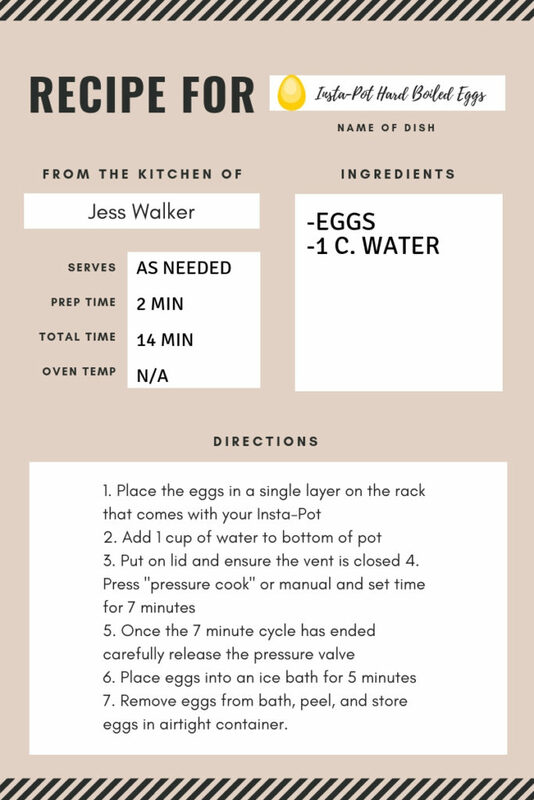 Place eggs into an ice bath for 5 minutes 7. Remove eggs from bath. 8.Peel and store eggs in airtight container. 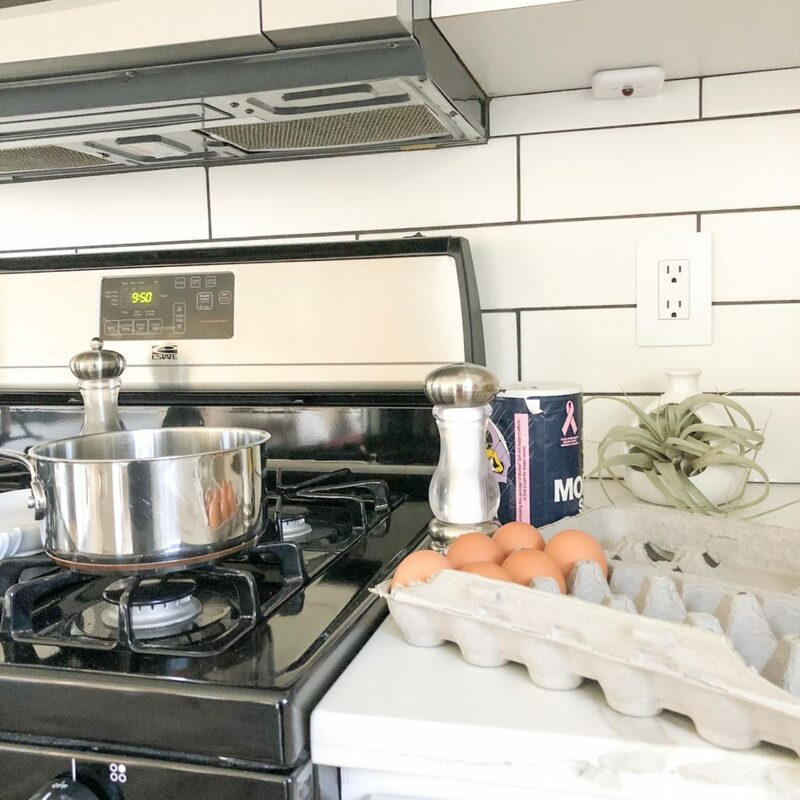 Y’all, I’ll never boil another egg the traditional way again! 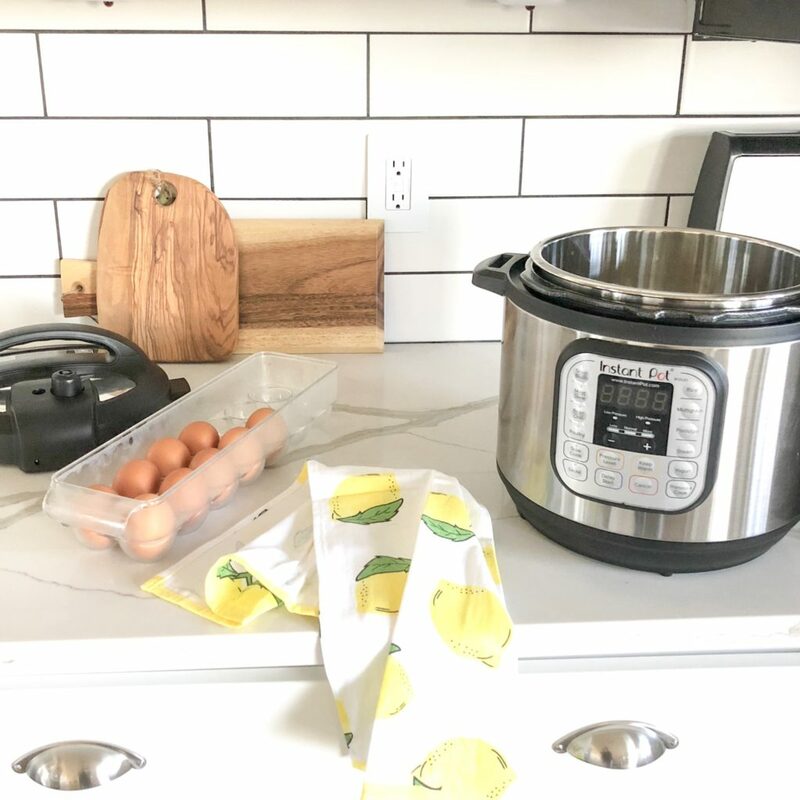 This isn’t an ad for Insta-Pot – I’m just a mom who has found something that makes her life easier! The eggs were easy to peel, both immediately after boiling and after being refrigerated for a couple days post boil. And, the yolks were perfect! I created this handy little graphic for you to save and reference if you are going to try the Insta-Pot method! Just right click or hold your finger down (for mobile) on the graphic and save!